When I first heard back in August that auditions were happening for A Klingon Christmas Carol, I immediately had to share with a group of fellow Star Trek nerd friends. After much fangirling and wishing they could move here for the experience, it was largely not-at-all discussed for months, until it popped up in my Facebook feed as a suggested event. I promised them I would go, so tickets were purchased for a double date on opening night. I’ve never been to the show (which has been running on and off in Minnesota since its world premiere in 2008), nor to any show at the Historic Mounds Theater, and I wanted to be right in the action. In addition to the normal theater seating, the Mounds has several four-person tables right up in front of the stage. With the purchase of those tickets, priced $35 each, not only do you get front-row seating and a table (which I thought was pretty cool), but you also get a free concession item of beer, soda, water, or treats. Pretty ideal! If you’d prefer to not spend that much per ticket, or to sit further away, the regular theater seats go for $18 apiece. Going in, I didn’t know what to expect other than that it would be A Christmas Carol for the Star Trek universe, starring Klingon characters and performed entirely in Klingon (with English supertitles). How many other plays can lay claim to being done wholly in a conlang? That in and of itself is a major feat. 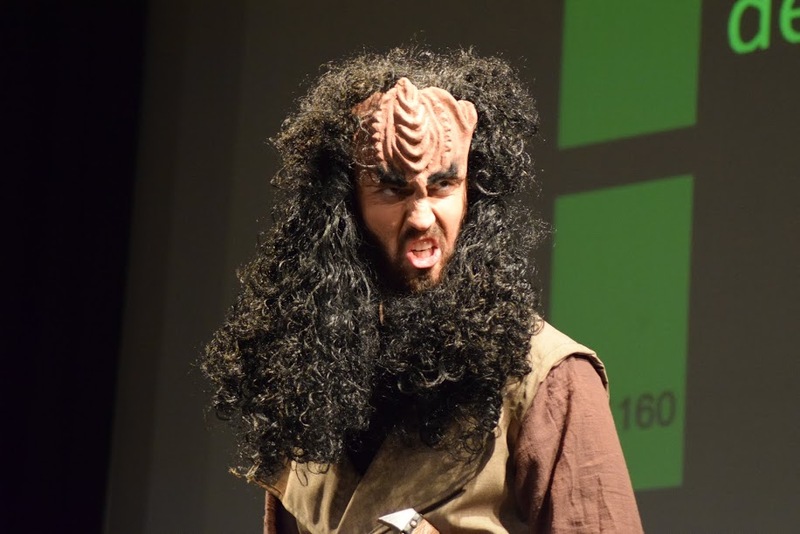 And, knowing canon, Klingons love them some Shakespeare—so why not Charles Dickens too? The space was sparsely decorated with a Klingon flag, and the stage reused main props throughout the show, which is just fine in my book. 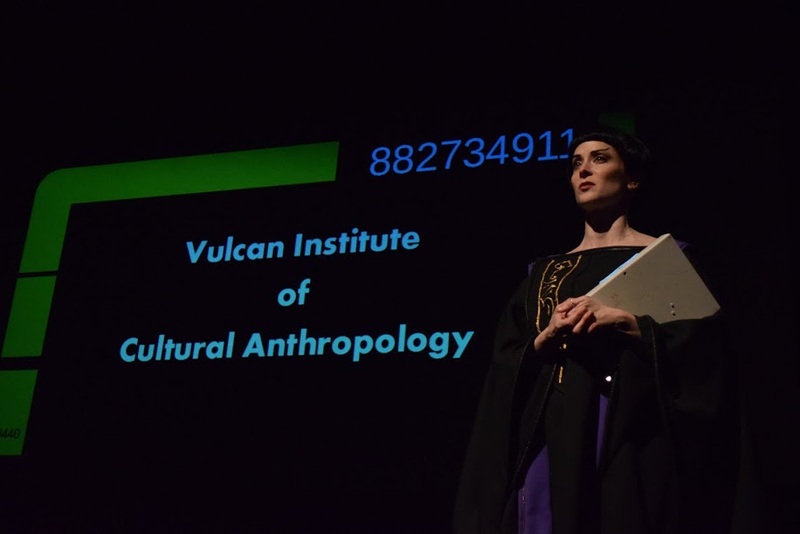 I loved that the narrator was a Vulcan, superbly embodied by Dawn Krosnowski, who gave it a lovely flair and grounding. 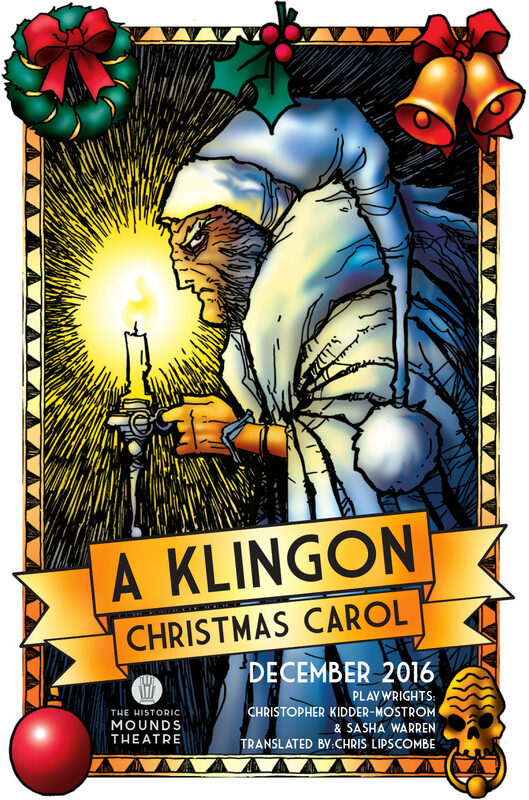 I also greatly appreciated that the story was essentially the same A Christmas Carol we are all familiar with, but adapted to make sense culturally in a Klingon context. Having the narration and the cultural relevance made for a rather nice balance (plus some awesome comedic moments). There were fight scenes, which were well choreographed; a disdain for SQuja’ and his money-lending profession, complete with Ferengi references; and some typical Vulcan haughtiness. Each character was well written with the cultural changes, as were the altered situations, which still retained the essential plot and the meaning of the overall story. There were still the Ghosts of Christmas Past, Present, and Future, a Scrooge, a Marley, a Timmy, a Cratchit, a Fezziwig, and others from the original story, but complete with Klingon-ified names and appropriate character tweaks. All in all, this was a fabulously adapted, delightfully acted, well-costumed, fully Klingon play that actually manages to capture the spirit of Christmas in a way that feels true to its source material. 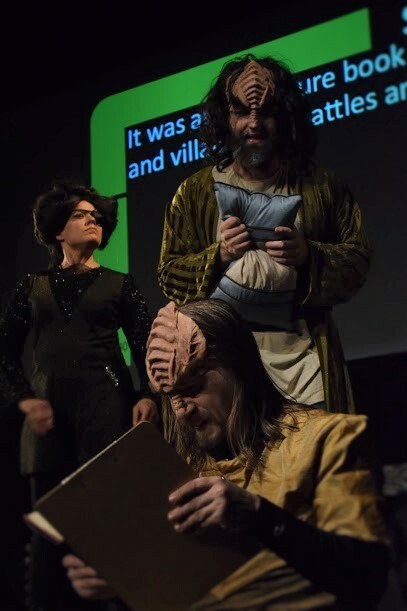 The only thing that could have made it better would be to have concession snacks be stocked with traditional Klingon fare and audience members cosplaying in Star Trek costumes. That said, there was bloodwine crafted by a local brewery available at intermission, which was a lovely touch. And after the play ended, we were highly encouraged to take photos with the cast. This is definitely a must-see for any Trekkie, young or old. 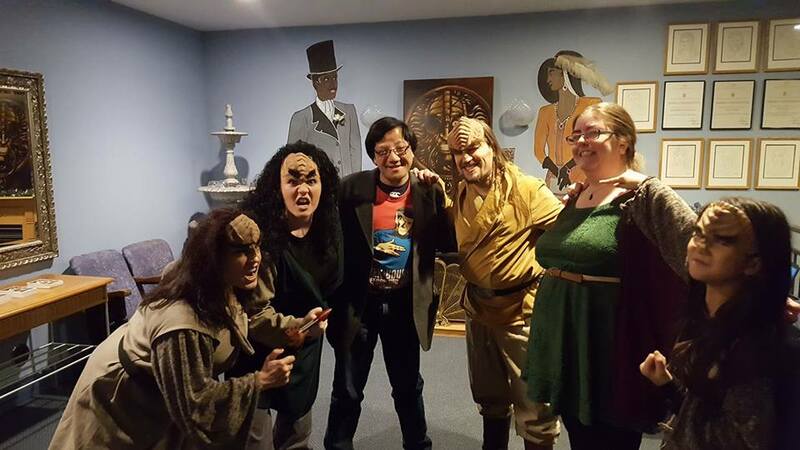 Showings of A Klingon Christmas Carol continue Fridays and Saturdays at 7:30 p.m. and Sundays at 4:30 p.m. through December 23. Tickets are available through the Historic Mounds Theatre website. Qapla’! Me and my fiancé with some of the cast.